Saturday, April 27 and Sunday, April 28. A busy weekend (in terms of birds and visitors) was highlighted by BBBO’s first Yellow-throated Warbler banded in the history of the station on Sunday! We knew it was a special bird in the holding bag when the wonderful Marilyn Guenther returned to the McKinney Banding Lab with a huge smile on her face. Marilyn got a big kiss from me when I carefully removed the bird from the bag in front of a large crowd of excited onlookers (sorry for the kiss attack, Marilyn!). 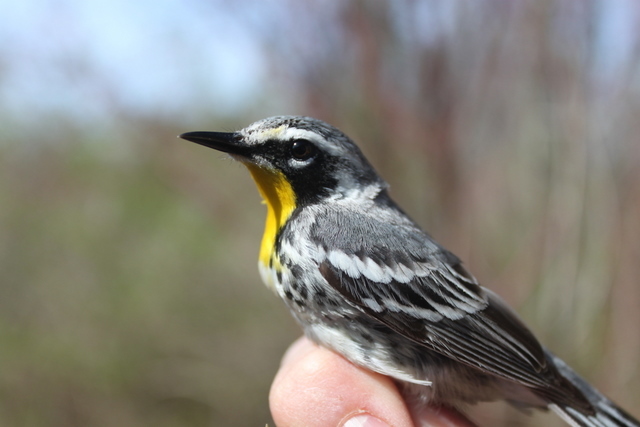 The core of the Yellow-throated Warbler range is in the southeastern U.S. and the species is not commonly seen in New York. 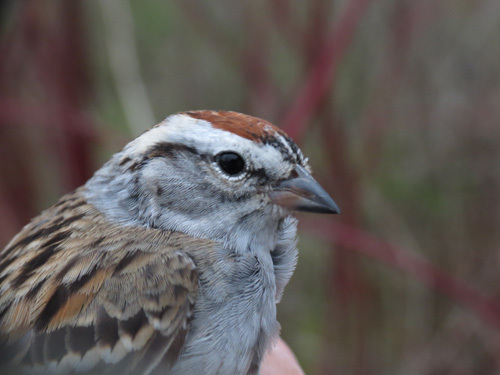 We identified the bird as a second-year female, banded her, took some measurements and plenty of photos, and sent her on her way… The weekend began with a flurry of chickadees, providing students from Cornell’s Field Methods in Bird Banding class a nice end-of-semester challenge. Sarah MacLean, a graduating senior and licensed bander, did a remarkable job as bander-in-charge on this busy weekend. The students did most of the banding and fielded questions from a never-ending stream of visitors. Birders from the Spring Field Ornithology class at the Cornell Lab of Ornithology (an adult education course) visited both days and another large group from Chemung County Audubon arrived on Saturday as well. Ryan Kayhart arrived for the spring and was greeted by the first Black-and-white Warbler and Blue-headed Vireo of the season. We ended Saturday with 134 birds banded (78 chickadees) and 62 recaptures. Sunday was a gorgeous day for late April along the lakeshore. Bright sunshine and light southerly winds brought us a Northern Mockingbird and Brown Thrasher (we were hoping for a Gray Catbird and a mimid trifecta, but it was a remarkable day nonetheless). Our first Common Yellowthroat (a sharp-looking male) was captured among the 113 new and 12 recaptured birds handled. Additional warblers included Palm, Black-and-white, and Yellow-rumped, while sparrows included Fox, Chipping, Song and Swamp. Special thanks to everyone who helped this weekend, and to Andrea Patterson and David Mathiason for remaking all of the ropes on the elevated nets–wow, what a difference! brookser	Spring Banding	Comments Off on 76% Chickadee 23% Other! Thursday April 25, 2013. 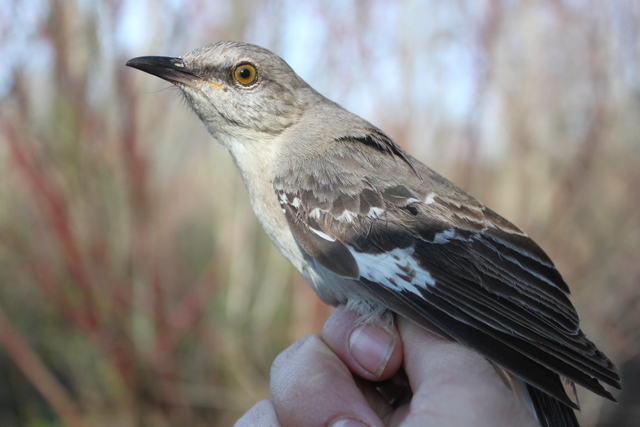 85 new bands of 16 species; 25 recaps. New species: Yellow Warbler and Eastern Towhee. It was a lovely day at BBBO – more blue skies, a light southerly wind, and just a few fluffy clouds. The chickadee numbers are not overwhelming (only 39 new ones today) and we are getting a diverse handful of new species. 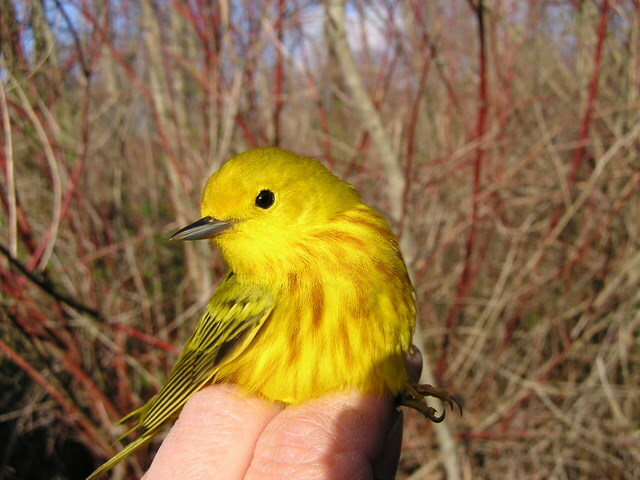 After the long slow snowy spring we’ve been having, the first sunny Yellow Warbler was a real treat. A second Pine Warbler surprised us all, and both Myrtle and Palm Warblers made an appearance. Three Blue-Grey Gnatcatchers at once were a tiny delight, and three Northern Cardinals at once were a painful one! 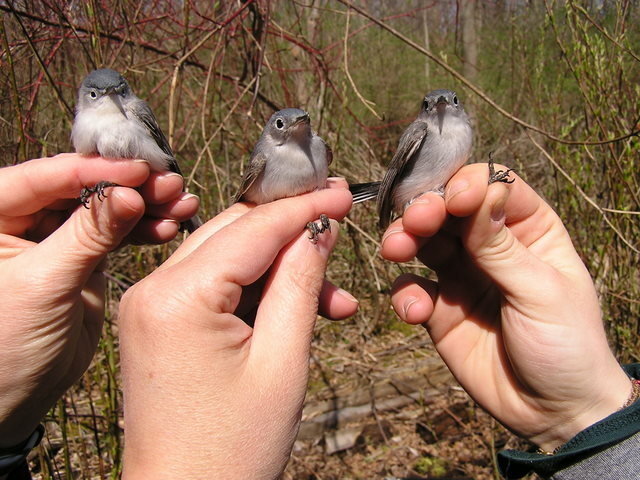 One male (l) and two female Blue-Gray Gnatcatchers. We pulled them from adjacent nets and hurried them back to the station for banding and a quick photo. Another Pine Warbler. This one is still very drab, but he (or she) is showing a hint of yellow here and there. No hidden yellow here! His sunny colors are on full display! Wednesday April 24, 2013 51 new birds of 12 species; 10 recaps. Bird of the day continues to be Black-capped Chickadee with 21 new bands today. Also of note was Ruby-crowned Kinglet with 16 new bands. 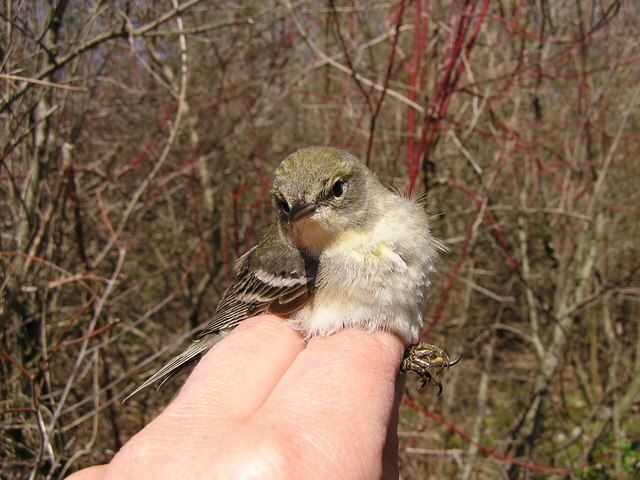 New species for the season were Nashville Warbler and Black-throated Green Warbler. We only opened the front nets at sunrise because of uncertain weather, limited staff, and the possibility of large numbers of birds arriving on the overnight south winds. None of the threats materialized and at hour 2.5 we opened all the nets. A contingent of about a dozen visitors from the Henrietta Senior Citizens group were able to see most of the day’s warblers processed as well accompanying us on two net checks. Chickadees . . . check. New Species . . . check check check check check check. Andrea Patterson	Spring Banding	Comments Off on Chickadees . . . check. New Species . . . check check check check check check. Tuesday April 23, 2013. 112 new birds of 14 species, 30 recaps. New species: Mourning Dove, Yellow-shafted Flicker, Blue Jay, Northern Waterthrush, Chipping Sparrow, American Goldfinch. Finally we get a beautiful sunny day at Braddock Bay! A little chilly, but almost no wind and a clear blue sky. The chickadees must have decided it was another good day to move, because they were flitting through the bushes and finding our nets all morning long. I tend to think of chickadees as a “mid-morning” bird because while our busiest net runs are often within an hour or two of sunrise, chickadees often don’t seem to show up until around 9:00 AM. This has not been the case this spring, however, as they have been awake and active even before sunrise. We banded 87 new chickadees today, and I’m certain the wave isn’t over yet. 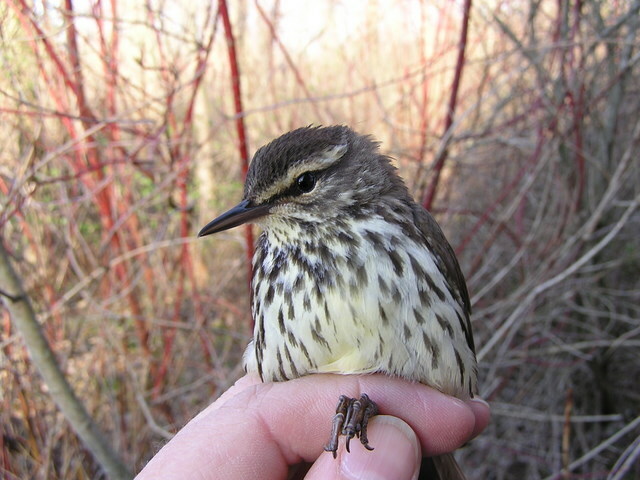 The first Northern Waterthrush of the spring.